Rickshaws in front of Sanmon Gate, the main entrance gate of Zojoji temple in Shiba, Tokyo. Six Tokugawa Shoguns and wives and children of shoguns were entombed at the Tokugawa mausoleum at Zojoji. 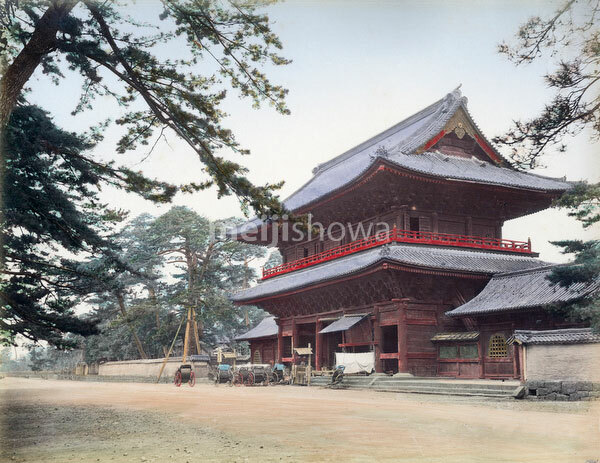 Much of the mausoleum was destroyed during the Great Kanto Earthquake of 1923 (Taisho 12) and what survived, was burnt down during the US fire bombings of Tokyo in 1945 (Showa 20).